Available most commonly from beef, buffalo, lamb, pork, and veal, this cut of meat is taken from the foreleg of the animal. Since the Shank consists of a large portion of connective tissue, the meat will be tough for general use. 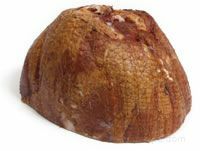 Therefore, a Shank bone with the meat is often used for recipes that either braise or slow cook the meat to tenderize it. Soups, stews, and braised meat dishes are commonly prepared with a Shank bone and meat.